But one of my go-to favorites when I don’t want to include eggs is making an egg substitute out of chia seeds. They’re loaded with fiber and omega-3s. They are an excellent source of magnesium and calcium, which help with several crucial functions, including relaxation. They add bulk, fill you up, and help to regulate elimination (yer poops!). 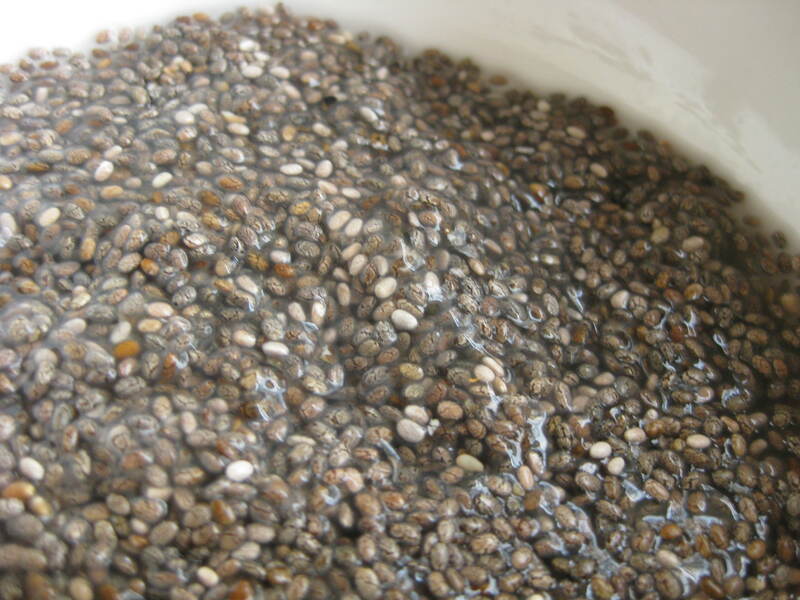 When you add water to chia seeds, they turn into kind of a gel. If you ever did have a Chia Pet, you probably remember this goo. Well, this goo is also an excellent substitute for eggs in baking! And it’s super-easy to make. Here’s how. For one egg equivalent, add 1 Tbsp. chia seeds to 3 Tbsp. water. Let sit for 15 minutes. Stir, then use as you would eggs in baking. That’s it! So easy and now you can get on with your baking. Enjoy! Do you use egg replacements in your baking? Did you ever have a Chia Pet? I haven’t ever tried this. So then do you have a Tbsp. of crunchy seeds in whatever you’re baking? My chia pet was a big disappointment, it just got sort of mouldy with a few desultory sprouts. Using chia as an egg replacer however has been a smashing success! I love how light it makes baked goods and the fabulous nutritional benefits are the icing on the cake! I’ve used Flax because my grandson had a severe egg allergy. I’m going to try the chia seeds also. Flax works well when breading also. I like it better than eggs. Chia and I are buds. Love this stuff. A tablespoon added to oatmeal makes it like pudding! Dry chia seeds? To a single bowl of oatmeal – 1 tbsp? Thanks! Do you mean can you add a Tbsp of chia seeds to oatmeal? Sure! I’ve never tried it but you certainly could 🙂 One Tbsp would be a good amount. More than that might make your oatmeal too thick! Wow, I never knew you could substitute chia seeds for an egg. How did you find out about this? I have tried chia seeds but I can’t handle the gel consistency. I have put them on my morning cereal and I have to wolf it down before the milk gets all gel-like. The only way I have enjoyed them is topped on a spoonful of peanut butter. Oh Jackie you gotta try it in yogurt. I put a few tblsp in my tea or juice throughout the day. You can make chia bread that is pretty darn good too. Or put it in your kids or your own jelly. (you can even make your own jelly… with cooking fruit or raw and mixing it!) this stuff is so healthy and alot more versatile than most think! Chia seeds are the best! I haven’t used them in cooking, though. Mostly I just drink my chia seeds. I want to try it as an egg replacement in my favorite cookie recipe. 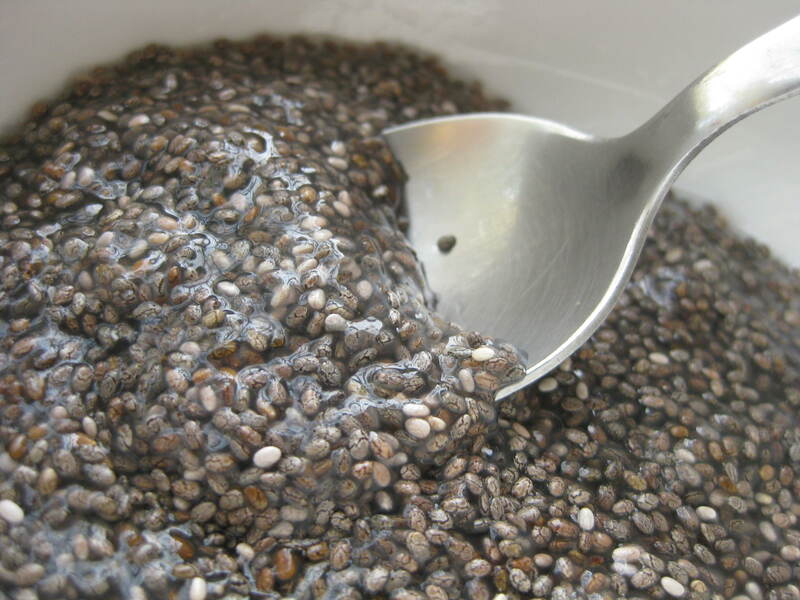 Do you grind the chia seeds for this or leave them whole? I’ve heard of grinding them, but haven’t tried it yet. I’ve always kept them whole, but you can definitely grind them! Great Egg Replacement for cooking!!! Gonna try using it as an egg replacer too. Oh my gosh. I don’t know what we did wrong, but my friend and I just tried this tip in our box brownies mix and it’s failing miserably! Replaced the egg with a quick chia gel like you said but the brownies haven’t become solid after cooking! Totally soupy/gooey.. Any thoughts on what happened? I’m sorry to hear it didn’t work out for you. It sounds like it just had a strange reaction with some content (or contents) of the box brownies. It’s hard to know what exactly goes in the box ingredients and how they will react to anything other than what the box says. The chia egg replacer has worked great with brownies made from scratch. Jelly, try using yogurt if you are only looking for a vegetarian option and not vegan. Works out great even with box brownies. 1/2 cup yogurt = 1 egg. oops…kellie !! sorry for the typo. I bake A LOT because it’s fun and because my son has multiple food allergies, two of which are corn (homemade baking powder) and egg. I have had the worst luck, with subbing egg with flaxseed in scratch brownie recipes. The butter separates. It bakes cakes, muffins, cupcakes, and quick breads just fine. I have tried recipes that are written egg-free, but they aren’t as wonderful as the recipes I want to use; they lack that gooey consistency that we associate with brownies. I wonder if chia seeds will do.